Suffering from Foot Corn? No more!! A corn is a localized thickening of the skin due to pressure. Corns often occur on the top of the toes where there is pressure from the shoes. They also occur at the sole of the foot and on the palms as calluses and in between toes. Certain corns may become entwined with the nerves of the skin, these corns are particularly painful. Calluses are usually bigger than corns and are rarely painful. Corns appear as white, grey, yellow or brown in color, depending on your skin type. Stitch or seam inside the shoe may rub against the toe. Surgery to the lower extremities. Wearing sandals without socks can create problems. Not using gloves while working can cause corns on hands. Get a right pair of footwear and socks. Wear shoes with extra padding. Medicated pads helps to get rid of foot corns fast but there is a danger of allergic reaction too. They are aggressive in nature due to which it might attack the good tissues. Corn plasters should be avoided by diabetics or by patients suffering from poor circulation as it may lead to ulcers. Use a pumice stone daily to reduce the thickness of the corn. One needs to soak a cloth in vinegar and tie throughout the day. The corn will come off by its root. Tie a slice of fresh lime on the corn and keep it overnight. Massage it 2-3 times a day with castor oil. Repeat this till the corn softens. Soak the foot in warm water with Epsom salt (magnesium sulphate). In case, corns reappear despite taking the above mentioned precaution, one must consult a podiatrist or a skin specialist. Surgery need to be considered only if the condition is very serious. 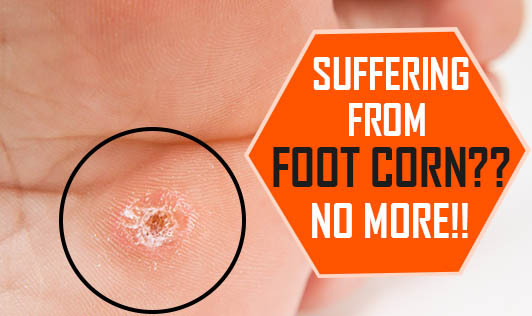 Foot Corn is a very common problem and so we tend to ignore it. But it surely needs treatment and care should be taken before it gets serious.